You can create online assignments for students to submit their assignments through Canvas. Students can submit audio or video recordings by recording new media or uploading existing media. Canvas supports media uploads up to 500 MB. 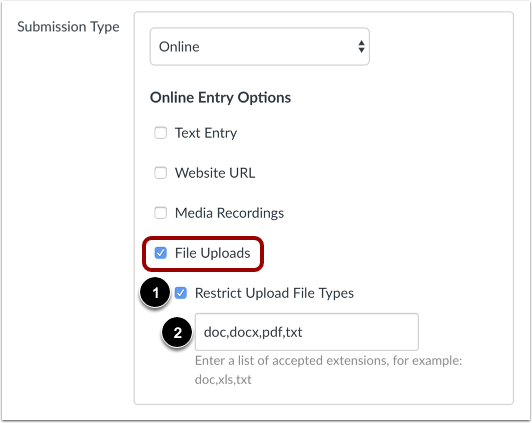 When allowing file uploads as an online entry option, you can restrict certain types of files for assignment submissions. In the case of restricting assignments with an odd or unusual file type, try adding it to your course to confirm the file is accepted before requesting students to submit the file type. If your institution has enabled Google Docs, the Google Apps LTI, or the Microsoft Office 365 LTI, students can upload files from their respective Google Drive or OneDrive account directly. (If only Google Docs are enabled for your institution, students must connect to Google Drive as a web service to submit an assignment as a Google Doc, Google Sheet, or Google Slide.) You can allow Google Drive and OneDrive files as submission types by selecting the File Uploads checkbox when creating an assignment. Students can submit Google Doc (.gdoc), Google Sheet (.gsheet), or Google Slide (.gslide) files. They can also use Google Docs to submit uploaded Word (.doc/.docx), Excel (.xls/.xlsx), PowerPoint (.ppt/.pptx), and PDF files not converted to Google Docs formatting. When Google file types are submitted as an assignment submission, those files will convert to their Microsoft counterpart file types and appear in the submission as respective Word, Excel, or PowerPoint files. Canvas uses the conversion file type for submissions (and to render supported file types as DocViewer files in SpeedGrader), so if you want to restrict file types to only include Google file types, you must also include the file types for each respective Microsoft file type as well. For instance, if you want to only allow Google Slide submissions, you must include .pptx as a restrictive file type, otherwise Canvas will not show the .gslide files in the Google Doc tab. 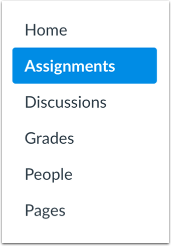 To create a new assignment, click the Add Assignment button. Add details to the assignment. 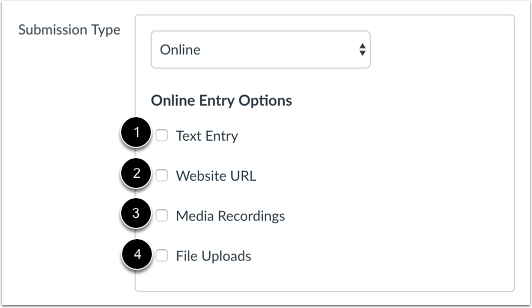 In the Submission Type drop-down menu, select the Online option. Text Entry : Students can submit their assignment directly in the Rich Content Editor. DocViewer annotations are not available for text entry submissions. Additionally, text entry submissions cannot be re-uploaded to the Gradebook. Website URLs : Students can submit a URL that fulfills the assignment. DocViewer annotations are not available for website URL submissions. Additionally, website URL submissions cannot be re-uploaded to the Gradebook. Media Recordings : Students can submit an audio or video recording that fulfills the assignment. They can either record new media or upload existing media. Video and audio uploads to Canvas can be up to 500 MB. DocViewer annotations are not available for media recording submissions. Additionally, media recording submissions cannot be downloaded. File Uploads : Students can upload a file to fulfill the assignment. DocViewer annotations are available for supported file types in SpeedGrader. Additionally, if your institution has enabled Google Docs, the Google Apps LTI, or the Microsoft Office 365 LTI, students can upload files from their respective Google Drive or OneDrive account directly. If only Google Docs are enabled for your institution, students must connect to Google Docs as a web service to submit an assignment as a Google Doc, Google Sheet, or Google Slide. File upload submissions can be downloaded and re-uploaded to the Gradebook. Note: If your institution has enabled the Microsoft Office 365 LTI, you must select either the File Uploads option or both the Website URL and File Uploads options to use the Office 365 tab on the assignment submission page. If you only select Website URL as an entry option, the Office 365 tab will not function properly. If you allow file uploads, you can choose to restrict submissions to specific file types. To enable this option, click the Restrict Upload File Types checkbox . In the Allowed File Extensions field , enter a list of accepted extensions. All file types need to be separated by a comma. You can include spaces, caps, and periods in assignment file names. Note: In the case of an odd or unusual file type, try adding it to your course to confirm the file is accepted before requesting students to submit the file type. To save the assignment and publish it, click the Save & Publish button . To save the assignment as a draft, click the Save button . Previous Topic:How do I create rules for an assignment group? Next Topic:How do I add an assignment using an external app? Table of Contents > Assignments > How do I create an online assignment? 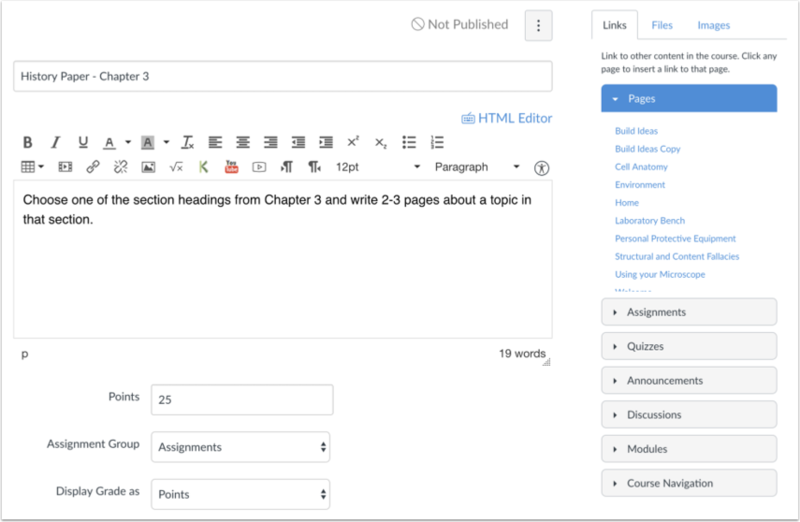 Re: how do students upload their assignments to canvas? Re: How to set-up a drop box?